It’s entirely possible that September 2016 marks the worst month of German chancellor Angela Merkel’s career. 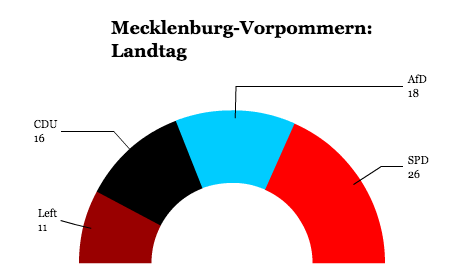 Merkel’s center-right party, the Christlich Demokratische Union (CDU, Christian Democratic Union) fell to third place in Mecklenburg-Vorpommern, a relatively low-population state of just 1.6 million that sprawls along the northern edge of what used to be East Germany. While the center-left Sozialdemokratische Partei Deutschlands (SPD, Social Democratic Party) has been traditionally stronger there in elections since reunification, two factors made the CDU’s loss particularly embarrassing. The first is that it’s the state that Merkel has represented since her first election in 1990 shorly after German reunification. 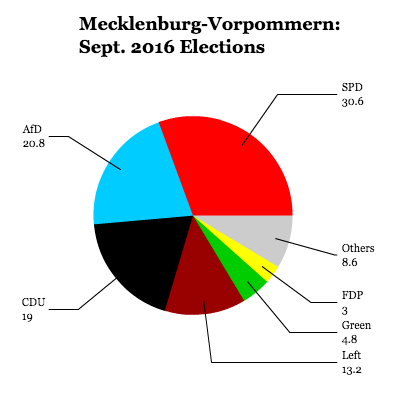 The second, and more ominous, is that the CDU fell behind the eurosceptic, anti-refugee Alternative für Deutschland (Afd, Alternative for Germany), a relatively new party founded in 2013 that today holds seats in 10 of Germany’s 16 state assemblies and that, according to recent polls, will easily win seats in the Bundestag in next September’s federal elections. 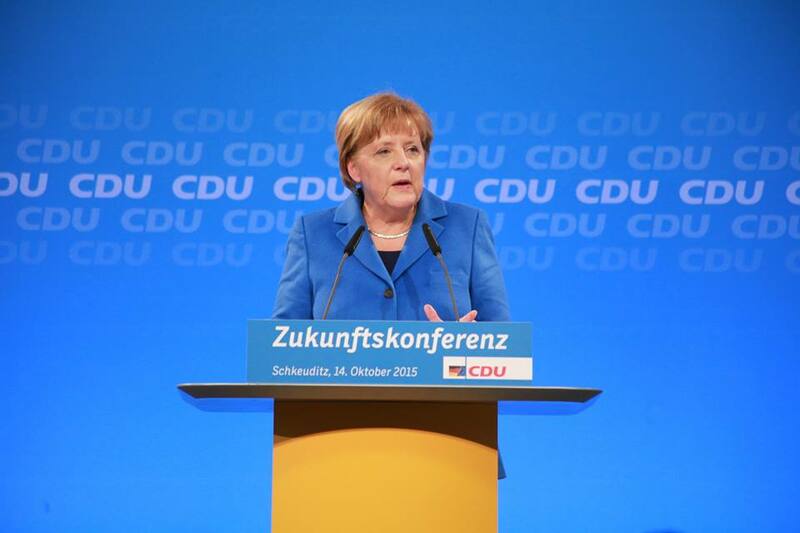 Two weeks later, on September 18, Merkel’s CDU also suffered losses in Berlin’s state election. 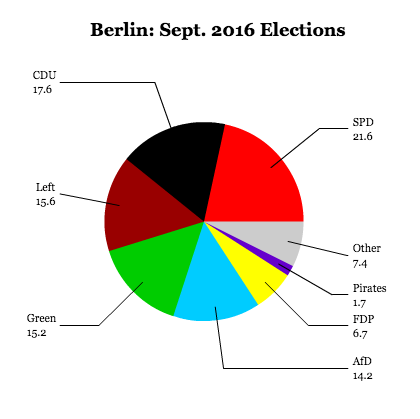 As left-wing parties have long dominated Berlin’s politics, and the SPD placed first and Germany’s Die Linke (the Left) and Die Grünen (the Greens) placed third and fourth behind the CDU. 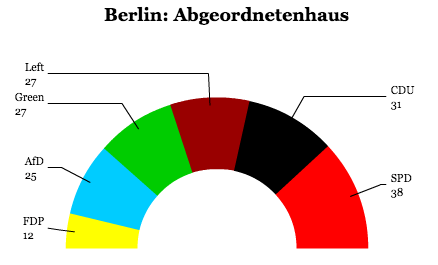 But even in Berlin, the AfD still won 14.2% of the vote. Taken together, the state election results forced a mea culpa from Merkel on Monday. The chancellor, who is expected (though by no means certain) to seek a fourth consecutive term next year, departed from the calm, steely confidence that since last summer has characterized her commitment to accept and integrate over a million Syrian refugees within Germany’s borders. Merkel admitted, however, that she would, if possible, rewind the clock to better prepare her country and her government for the challenge of admitting so many new migrants, and she admitted lapses in her administration’s communications. With the AfD showing no signs of abating, it’s clear that its attacks on Merkel’s open-door policy are working. Merkel’s statement earlier this week admitted that her policies have not unfolded as smoothly as she’d hoped. RELATED: Can Hillary Clinton become America’s Mutti? Indeed, German polls are starting to show that voters are souring on Merkel and her approach to migration, so much that in one poll in August for Bild, a majority of voters no longer support a fourth term for Merkel. All of which has led to hand-wringing both in Germany and abroad that Merkel’s days are numbered. One of the odder results of this week’s Norwegian election is that while it boosted the numbers of seats for the two parties that are most in favor of membership in the European Union, Norway is today less likely than ever to seek EU membership. 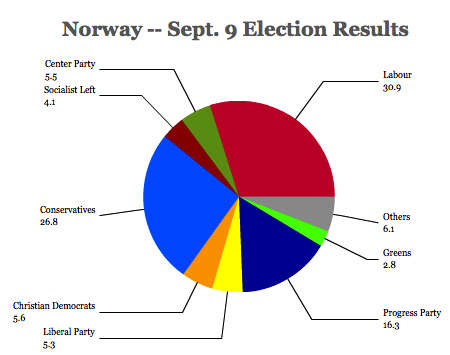 Together, the center-left Arbeiderpartiet (Labour Party) and the center-right Høyre (the Conservative Party) will hold 103 seats as the largest and second-largest parties, respectively, in the Storting, Norway’s 169-member parliament — that’s a larger number of cumulative seats than the two pro-European parties have won since the 1985 election. But EU membership is firmly not on the agenda of Norway’s likely new prime minister, Erna Solberg, just like it wasn’t on the agenda of outgoing prime minister Jens Stoltenberg during his eight years in government. One of the obvious reasons is that EU membership is massively unpopular among Norwegians — an August poll found that 70% oppose membership to just 19% who support it. Proponents of EU membership argue that because Norway is part of Europe’s internal market, it is already subject to many of the European Union’s rules. (Norway is also a member of the Schengen free-travel zone that has largely eliminated national border controls within Europe) But until Norway is a member of the European Union, it has absolutely no input on the content of those rules. 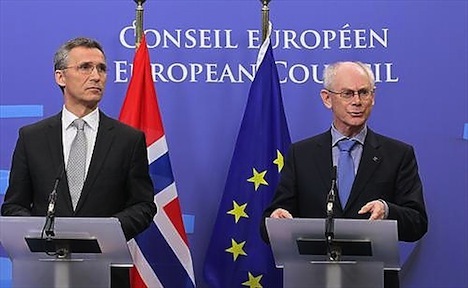 Stoltenberg (pictured above left with European Council president Herman Van Rompuy) has called the result ‘fax diplomacy,’ with Norwegian legislators forced to wait for instructions from Brussels in the form of the latest directive. Since 1994, when Norwegians narrowly rejected EU membership in a referendum, Norway has been a member of the European Economic Area (EEA), an agreement among the EU countries, Norway, Iceland and Liechtenstein that allows Norway and the other non-EU countries access to the European single market. Opponents argue that Norway, with just 5 million people, would have a negligible input in a union that now encompasses 28 countries and nearly 508 million people. They also argue that with one of Europe’s wealthiest economies, Norway would be forced to contribute part of its oil largesse to shore up the shakier economies of southern and eastern Europe. There are also sovereignty considerations for a country that didn’t win its independence from Sweden until 1905 — and then suffered German occupation from 1940 to 1945. Though Norwegians also often cite the desire to keep their rich north Atlantic fisheries free of EU competition, Norway already has a special arrangement with the European Union on fisheries and agriculture, and it’s likely that it would continue to have a special arrangement as an EU member, in the same way that the United Kingdom has opted out of both the eurozone and the Schengen area and has negotiated its own EU budget rebate. Erna Solberg, the longtime leader of Norway’s Conservative Party, will become Norway’s next prime minister after results from today’s Norwegian parliamentary election showed all four of Norway’s center-right parties winning enough seats to form an absolute majority in Norway’s Storting (parliament). Prime minister Jen Stoltenberg has conceded defeat, and will resign shortly after presenting Norway’s next budget in mid-October. 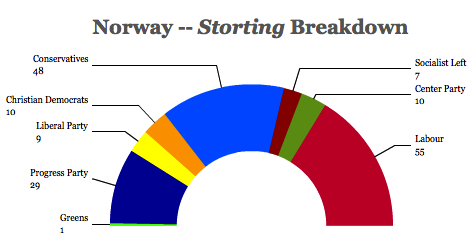 The result’s a lot more complicated than that — for starters, Stoltenberg’s party, the center-left Arbeiderpartiet (Labour Party) actually won more votes than Solberg’s party, the center-right Høyre (literally the ‘Right’) — so much so that Labour will have around 55 seats to just 48 for the Conservatives. It’s not an unexpected result because while polls earlier this summer showed the Conservatives leading Labour, support for Labour has increased as Norwegians focused on the campaign. Moreover, Labour has emerged in every election since 1924 with more support and seats than Norway’s various opposition parties, and its long pedigree as the natural party of government means that it has a deeper wellspring of support among the Norwegian electorate. But that wasn’t enough to pull off a victory for two reasons. First, Labour’s support — around 30.9% — is smaller than the 35.4% it won in the September 2009 election, natural enough for a party that’s been in power for eight years and is seeking a third consecutive term. Secondly, the two small parties that comprise the ‘red-green’ coalition that Stoltenberg heads, Sosialistisk Venstreparti (Socialist Left Party) and the Senterpartiet (Centre Party), did incredibly poorly, so the ‘red-green’ coalition is projected to win just a cumulative 72 seats in the 169-member Storting. Meanwhile, Solberg’s Conservatives cannot govern by themselves, but must form an alliance among the four major center-right parties that will join parliament. That includes the Kristelig Folkeparti (Christian Democratic Party), a moderately conservative party that led Norway’s last center-right government under prime minister Kjell Magne Bondevik between 1997 and 2000 and again from 2001 to 2005, and it includes Venstre (literally, ‘the Left,’ but commonly known as the Liberal Party). All three parties worked together in government between 2001 and 2005 and all three parties generally accept the fait accompli of the Norwegian social welfare state and Labour’s rules to stash much of Norway’s annual budget surplus in the country’s massive oil wealth fund. The Conservatives, in particular, have spent the election arguing for slight changes to the status quo, such as lower business taxes and tweaks to Norway’s health care system, after a major rebranding exercise to grow beyond their base of Oslo business interests. 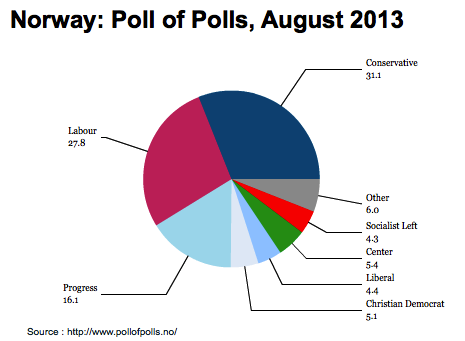 Though the Høyre (‘Right,’ or Conservative Party) consistently leads polls as the party mostly likely to emerge with the most support in Norway’s September 9 elections, there’s still uncertainty about the future of Norway’s government. That’s because while Conservative leader Erna Solberg is very likely to become Norway’s next prime minister and the Conservatives are widely tipped to win on September 9, the policies that her government will pursue will depend on the relative strength of the other center-right parties — notably the populist, anti-government, anti-immigration Framskrittspartiet (Progress Party), which remains the most controversial of Norway’s major parties. If it joins the Conservatives in government as predicted, it will be the first time that the Progress Party has joined any government since it was founded in the 1970s. If the election unfolds as polls predict, the Conservatives would win the largest share of the vote, around 32% and around 56 seats, which would be a historical victory against the Arbeiderpartiet (Labour Party), which is polling around 29% and around 51 seats. The Progress Party currently polls as the third-most popular party with around 14.5% support and around 27 seats. That means that the next government will require some kind of coalition between two of those three parties. 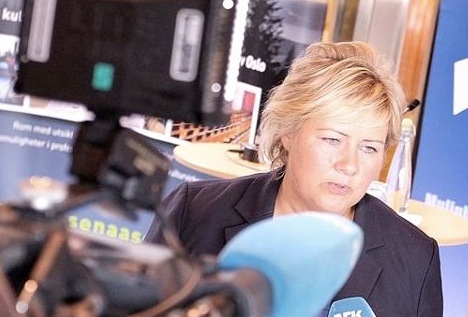 So while it’s not surprising that tensions are emerging during the campaign between Solberg and Progress Party leader Siv Jensen (pictured above) and that it’s clear coalition negotiations among the Conservatives, the Progress Party and other center-right allies are likely to be incredibly difficult, it is perhaps surprising that no one has really suggested a ‘grand coalition’ between Labour and the Conservatives as an alternative. While there’s no real precedent of ‘grand coalitions’ in recent Norwegian history, neither is there precedent for a Conservative-Progress government — both options would mark new ground for Norway. Solberg is riding high in polls today after a long stint in the wilderness for the Conservatives and a rebranding exercise designed to pull the Conservatives more fully to the center and expand the party’s relevance beyond its traditional image as a party solely for Norway’s business elite. That means that it has moved more closely to Labour’s position on many issues and it’s much closer to Labour than to the Progress Party on both economic and social issues alike. Nonetheless, there’s curiously little discussion about a ‘grand coalition,’ even as Norwegians assume that the Conservative-Progress coalition is virtually a done deal. That means that the Conservatives, a party that favors continuity over rupture, will govern with the Progress Party, which has historically favored rupture over continuity. 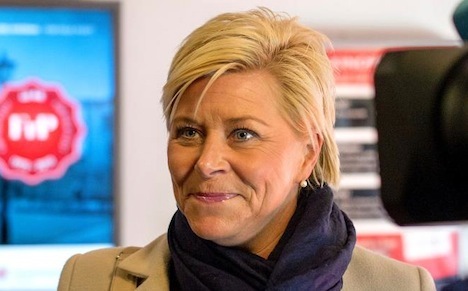 It will also likely mean that Jensen will become Norway’s next finance minister, an outcome that could scare moderate voters otherwise disposed to a Solberg-led government into supporting Labour instead. If, for some reason, the Conservatives win the election and don’t form a coalition with Progress, because negotiations stall or because Progress’s vote collapses, the Conservatives would more likely form a coalition with two smaller center-right parties or even try a minority government before pairing up with Labour, not least of which because Labour prime minister Jens Stoltenberg has spent much of his campaign warning about all the damage that a right-wing government would cause to Norwegian society. Though he’s making headlines this week for his stunt as a barely-disguised cab driver cruising the streets of Oslo to get a sense of the frustrations of Norwegian voters less than a month before Norway’s parliamentary elections, prime minister Jens Stoltenberg has long seemed destined to lose the September 9 vote. Stoltenberg, who leads the Arbeiderpartiet (Labour Party) and has served as Norway’s prime minister since 2005, is running for a third consecutive term, and poll shave consistently shown his party running behind the Høyre (literally the ‘Right,’ or Conservative Party), and Norway has braced throughout the year for the likelihood that its voters will elect a center-right government. It’s not unprecedented for Norway to have a right-leaning government — most recently, the Conservatives were part of a governing coalition led by Kjell Magne Bondevik and the Kristelig Folkeparti (Christian People’s Party) from 2001 to 2005. But if polls today are correct, the Conservative Party will actually win more votes than the long-dominant Labour Party, and therefore hold more seats in the Storting, Norway’s parliament, and that hasn’t happened in a Norwegian election since 1924. As I wrote earlier this summer, Erna Solberg, the leader of the Conservative Party since 2004, became the frontrunner in next month’s elections by rebranding the Conservatives as an acceptably moderate alternative to Labour. In many ways, Solberg’s Conservatives today share more in common with Labour than with their largest presumptive coalition partner, the more populist, far-right Framskrittspartiet (Progress Party), a party. But there’s still more or less a month to go before voting begins, and many Norwegians are still focused on their summer holidays than on the late-summer campaign. That means there’s more than enough time for Labour to make up the difference before September 9. 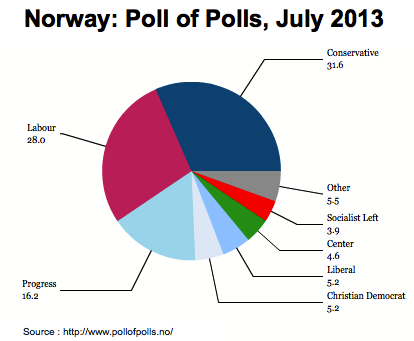 While that doesn’t necessarily mean that Labour will return to government, it does mean that Labour has a shot at retaining its place as the largest parliamentary party in Norway and, in a best-case scenario, could potentially form a new, broader coalition, perhaps even with the Conservatives, to keep the Progress Party out of government. Norway kicks off a busy month of elections in Europe with parliamentary elections on September 9, and if the past year’s worth of polls are to be trusted, Norwegians seem set to take a right turn, despite one of the best economies in Europe. 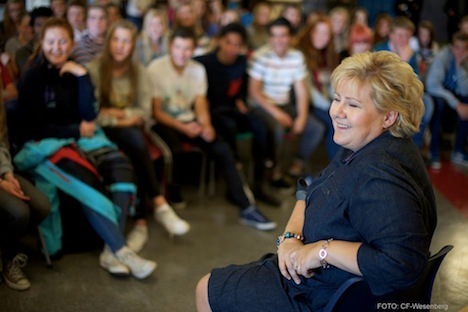 If they do so, Norway is likely to have only the second female prime minister in its history — Erna Solberg, who since 2004 has been the leader of the Høyre (literally the ‘Right,’ or more commonly, the Conservative Party). With less than two months to go, Solberg’s Conservatives have built a growing and steady lead over the governing Arbeiderpartiet (Labour Party) and prime minister Jens Stoltenberg, a popular prime minister who’s governed Norway since 2005. A familiar face as the Conservative leader for nearly a decade, Solberg served previously as a minister of local government and regional development from 2001 to 2005 in Norway’s previous center-right government, a role that earned her the nickname of ‘Jern-Erna,’ or ‘Iron Erna,’ and she bears some similarity to the other, more familiar center-right leader who’s running for reelection in September as well (catch an English interview with Solberg from April on the U.S.-based CNBC here). Winning a third consecutive term in office is difficult for any government because, as years go by, the front line of policymakers either leave government or become increasingly fatigued, and governing parties, who have an increasing political stake in the status quo, don’t often regenerate the same quality of new ideas that outside parties do while in opposition. But it’s hard to understand just why Labour seems so likely headed out of government, especially in light of Stoltenberg’s continued popularity. It’s even more baffling when you consider that Norway is one of the best governed states in Europe, let alone the world. Despite the fact that most of Europe is in recession or zero-growth mode, Norway grew by an estimated 3% in 2012, and the unemployment rate is a laughably low 3.5%. Thanks to its oil wealth, it has had balanced budgets for nearly two decades, the government routinely banks its surplus (an estimated 15% of GDP in 2012) in investment funds for future use, and Norway’s GDP per capita now exceeds $60,000. That leads to two questions: why are Norwegian voters so adamant about voting out its current government? And how did Solberg and the Conservatives become such clear frontrunners? The 2005 election (and the ensuing 2009 election) brought about the balance that’s largely held steady for the past eight years. 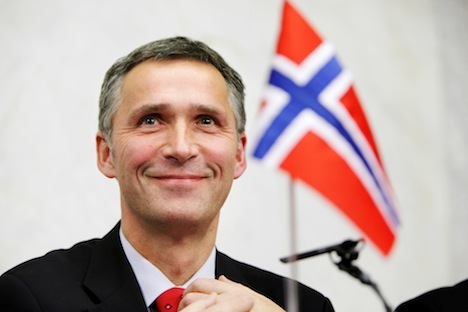 Stoltenberg currently governs with the support of a ‘Red-Green’ coalition dominated by Labour and its two smaller allies, the democratic socialist Sosialistisk Venstreparti (Socialist Left Party) and the Senterpartiet (Centre Party), a chiefly agrarian party that’s moved from the political right to the political left in recent years. Note that ‘green’ in Norway’s Red-Green coalition indicates the Center Party’s roots in rural life, not its environmental activism. The 2005 fall of the previous center-right government of prime minster Kjell Magne Bondevik brought a drop in support for both Kristelig Folkeparti (Christian Democratic Party) and his coalition partners, the Conservatives. That left the Framskrittspartiet (Progress Party), a relatively populist party known chiefly for its opposition to much of the Norwegian social welfare state, its advocacy of lower taxes, smaller government and deregulation, and its controversial anti-immigration stance, as the second-largest party in Norway’s parliament. Unlike Labour and the Conservatives, both of which were founded in the late 19th century, the Progress Party emerged only in the 1970s as a modern conservative anti-tax movement. Though it’s grown to become a major force in Norwegian politics over the 1990s and 20o0s, Progress has never formally joined any government, though that seems likely to change, as Solberg is expected to bring Progress into government if her party maintains its polling lead on September 9. Though if Solberg’s Conservatives win their expected landslide, they will do so in large part by consolidating left-leaning moderates that have supported Labour and right-leaning moderates that have supported Progress. That’s a huge jump from the 30 seats the Conservatives hold now, and it’s a massive jump from their 2005 debacle, when they won just 14.1% of the vote and a measly 23 seats.